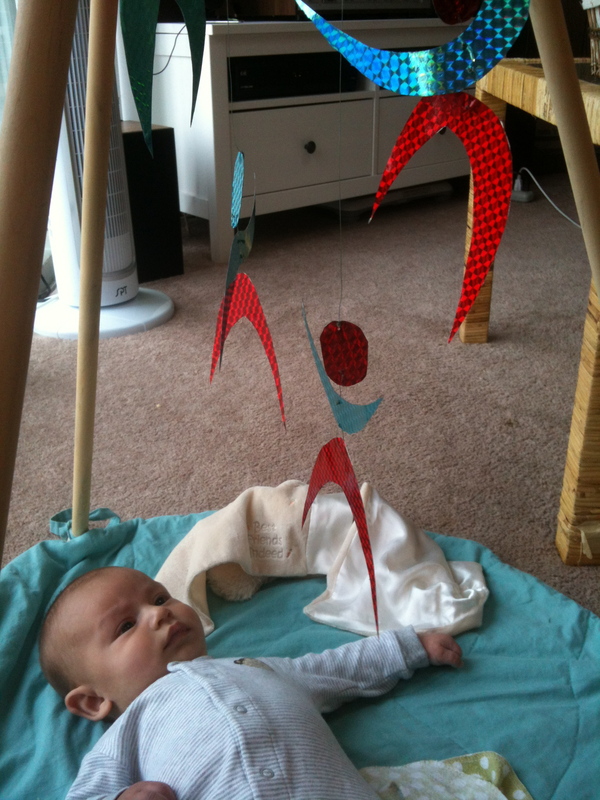 Watching the baby delight in a mobile is one of the simple pleasures in my day right now. Knowing that the Dancer Mobile he is enjoying is supporting his early Montessori education, was easy to DIY, and was cheap to boot is even better! I have to admit, the dancer mobile did not capture my attention at first. Its predecessor the Gobbi was so aesthetically pleasing to me with its roundness, its color gradient, and especially its sheep-y fuzziness. So, although I like my exacto-knife and shiny paper as much as the next gal, it took me awhile to start this project – but now I am so glad that I did. The tantalizing reflections from the holographic paper combined with the whimsical dancing figures have captured Miles’ attention in a new way. It is especially exciting to hear him squeal in delight when he succeeds in moving the mobile by brushing against it with his outstretched hand. Grasping, here we come! To make this mobile, I followed this tutorial I found online: The Dancer Mobile – Texas Health Moms. I am so appreciative for this post, as my alternative was to wing it and inevitably wind up frustrated. So thanks, Texas Health Moms! Armed with a tutorial, two pieces of adhesive holographic paper, some fishing line, and aforementioned exacto-knife, I got to work. I am so happy with how my mobile came out, but I think if I were to do it all over again I would change a few things. So here is my version of their already-wonderful instructions. 1. Print the template from Texas Health Moms or draw your own! If you draw your own, you’ll need four heads, four wavy arms, and four crazy legs. They need to fit on one 8×11 sheet of paper. I found the template dancers a bit big, so you can easily get away with making the pieces smaller in order to fit everything. If you are using four colors, you will need to draw two heads, two wavy arms, and two crazy legs on each piece of paper. Don’t cut the pieces out yet! 2. With one piece of the holographic paper face down on your work surface, carefully peel off the backing to expose the adhesive side. With the printed/drawn on side facing UP, lay the template sheet on the holographic paper. Make sure you don’t wrinkle the paper! 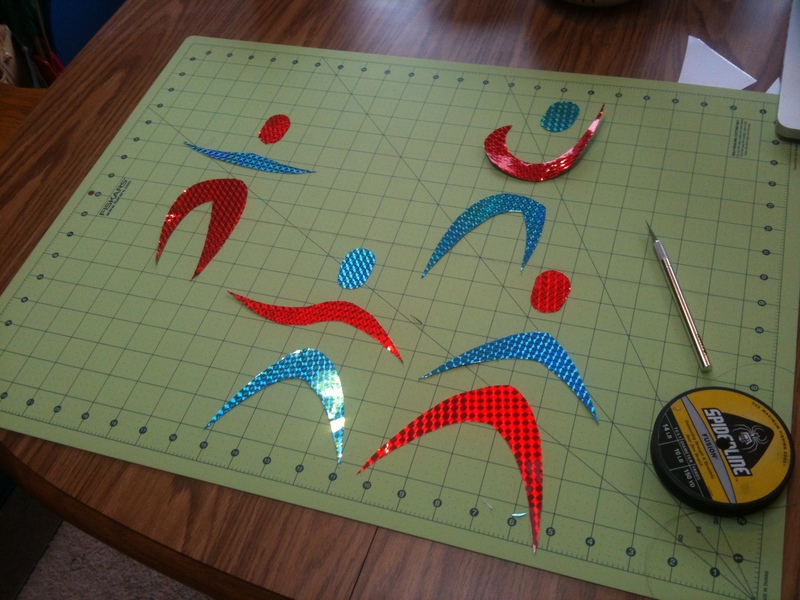 Then cut out the shapes with scissors or an exacto knife. If you are using four colors, repeat this step with another color and the second template sheet. These two colors will be “side one” of the two pairs of dancers. 3. Peel off the backing from the second piece of paper exactly as you did before. Now you are going to lay the cut out pieces (shiny side UP) on the holographic sheet – make sure that you leave space for all of the pieces. You will only be using half of your pieces if you have more than two colors. When you have all of the pieces arranged on the sheet, carefully trace around the shapes with your exacto knife to cut them out. Repeat with the fourth color if necessary. Now use the safety pin to poke holes in each shape at the points where you want to attach them. You will also need a poke a hole at the top of each head. Using your favorite technique, tie a knot at the end of the fishing line. Either using a needle or just your steady hand, thread the fishing line through the hole at the top of some legs and then through the hole at the bottom of the arms. The leg and arm colors that are face up should contrast. You will want to leave at least 1/4 inch of line between each piece to allow for some nice movement (they are dancers, remember)? Thread the fishing line through the hole a second time, making a loop to hold the body part in place. Now make another knot to secure your work and cut the fishing line. Voila! Repeat with all of the other pieces. 5. With the dancers all assembled, the last step is to hang them. Cut four pieces of fishing line – it is helpful to start with long pieces so you have something to work with. Thread a piece of fishing line through the hole in the top of the head, then thread it through again to make another loop. Repeat for the other three figures until you have four figures with fishing line growing out of their heads. You will want them all hung at varying lengths. Since my dancers were big and my available hanging space was small, I hung the two figures in the middle lower than the two on the outside. Working flat on your workspace, stagger the figures any way you want to provide visual interest/make them fit on your dowel. When you are happy with the look, take one of the outside pieces of line and wind it around the dowel at least five times, leaving enough extra to tie the loose end to the hanging piece of line. Repeat this process until all of the figures are secured to the dowel. Now cut a piece of line that is at least twice as long as your dowel. Wind and knot the line on each end of the dowel. Hang it where your baby can admire it for many mesmerized hours. I hope your family enjoys it as much as ours! Thank you so much for the instructions- can’t wait to get the paper and make my own! !